Bike Lane or Bike Route? What’s the difference? As Council went from Plan “A” to “C” they began turning bike lanes into bike routes. They did this because bike routes are seen as cheaper and less intrusive to the motor vehicles on our streets than bike lanes. While (slightly) less paint is required to mark a bike route, bike lanes should not be dismissed so easily. Nor should the city apply them interchangeably. 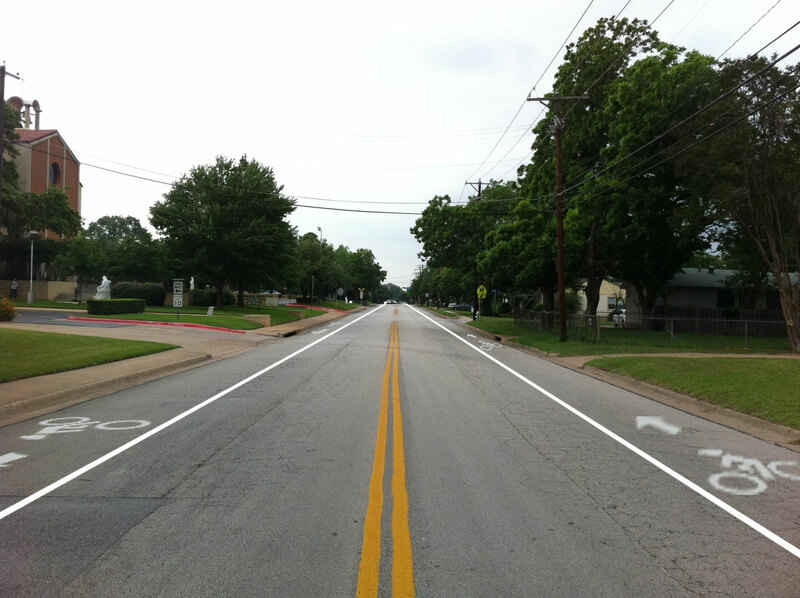 We should be choosing the right markings for the right streets for the right reasons. To learn more about these treatments, we will consult the Urban Bikeway Design Guide, recently produced by the National Association of City Transportation Officials. The guide has information about bike lanes, cycle tracks, intersection treatments, signals, and signs and markings. A basic bike lane consists of a white stripe to physically separate motor vehicles and bicycles with painted bike symbols and arrows to signify the purpose of the lane. Since bike lanes allow cyclists to have their own designated space on the road they mean that slower-moving bikes will not impede the flow of motor vehicle traffic thus debunking one of the opposition’s key myths. Lanes are recommended for streets with a posted speed limit higher than 25 mph (up to 35 mph). They are appropriate for all types of riders – both experienced and novice. A bike route is also called a shared lane marking. These consist of signs and lane markings which signify that a route is good for bicycles and (when properly designed) where in the lane a bicycle should ride. Increases awareness of a cyclist’s right to the road. Doesn’t require a greater street width as cyclists and vehicles travel in the same lane. Where the speed differential between bicyclist and motorist travel speeds is very low. Where street width can only accommodate a bicycle lane in one direction. On hills, lanes should be provided in the uphill direction. Along front-in angled parking, where a bike lane is undesirable. To strengthen connections in a bikeway network. To clarify bicyclist movement and positioning in challenging environments. Bike routes accommodate experienced cyclists, as novice cyclists likely won’t be willing to ride in the same lane as motor vehicles. They are a visual queue for motorists that bicyclists are allowed on the road. 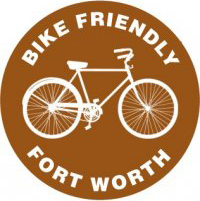 Since bicycles are currently allowed to ride in the street under Texas law, bike routes in Arlington would serve as an education device for motorists, but also as encouragement for bicyclists confident enough to ride in Arlington without a bike lane. In many cases, the most ideal hike and bike improvement scenario will not be achievable because of ROW issues, homeowner issues, and traffic engineering constraints. The City of Arlington should remain open to alternative solutions in these cases and utilize the entire toolbox of hike/bike treatment solutions found in Chapter 8- Design Guidelines. For example, if sidewalks are not immediately feasible due to funding constraints or ROW issues, traffic calming techniques within the roadway ROW may be acceptable ways to improve the safety of pedestrians and bicyclists. Parking should not be removed unless there is a great deal of public support for the bike lanes on that particular roadway, and a full public involvement process with adjacent residents and businesses is undertaken prior to removing parking. Bike lanes should be planned for streets because the width and speed of the road are appropriate for them. Bike routes should be planned for streets because the width and speed of the road are appropriate for them. At implementation time the actual design may change as needed, but the plan should be for what is appropriate overall, and bike routes should not be substituted for bike lanes simply because a road “feels” too narrow. Bike lanes accommodate the most users and therefore, when a road’s speed and geometry allows, should be the first choice. This past week the Council Subcommittee (formed to analyze the proposed hike and bike plan) was presented with their third option – Plan C – which actually adds some additional on-street bike routes back in. Only some though. Bike routes (which are painted symbols on the street at distant intervals, not stripes) tend to serve already experienced cyclists and mostly function to raise awareness of a cyclists’ right to be on the road – a great thing, but they’re simply not enough to accommodate Arlington moving forward over the next thirty years. To make Arlington more bike friendly, Plan “C” needs to be updated with more bike lanes. The entire idea behind updating the Plan in the first place was to make Arlington more accessible, by more people, through bicycling and walking. Until the Plan reflects that with more bike lanes, Arlington is getting a raw deal. 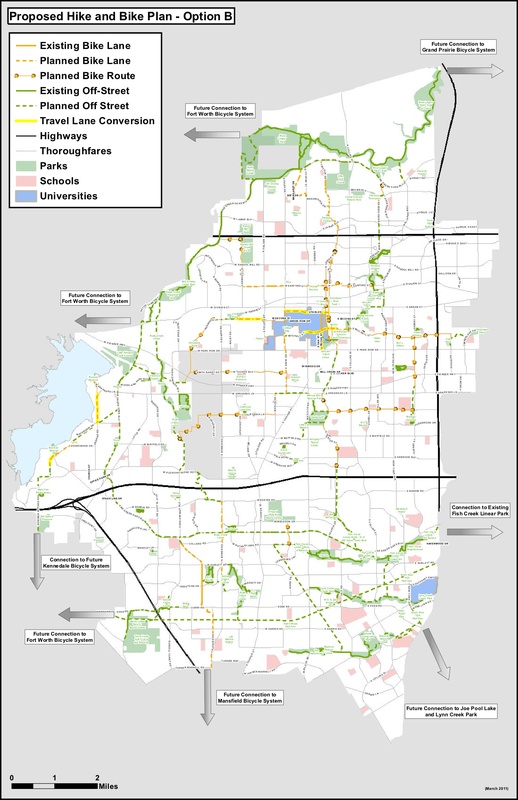 The original proposed Hike and Bike System Master Plan was developed by city staff and consultants over the course of almost two years with substantial public input. The plan is available for download here. Plan B was created in response to a vocal minority of opposition and their misinformation campaign. The original Hike & Bike Plan has been scaled back significantly, with input from the City Council subcommittee formed to further study the original plan (Councilmembers Shepard, Bennett, and Wilemon). Plan “B” is a drastic step backward from not only Plan A, but also the 2002 bike plan already in place. 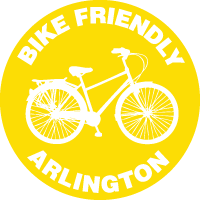 Implementing Plan B will not produce the stated goals of providing connectivity and safety to a wider range of Arlington residents that choose to walk or ride their bikes. At the request of the subcommittee, staff has added back in approximately 20 miles of bike routes to Plan B. 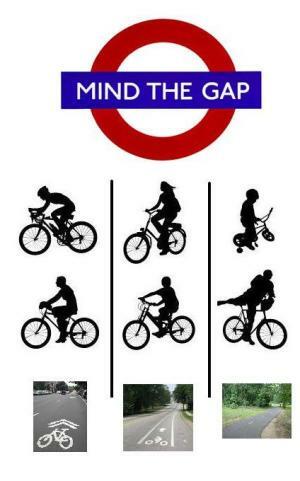 Write council and tell them to “Mind the Gap” that exists for riders of different ability. Tell them about the Plan that YOU want. 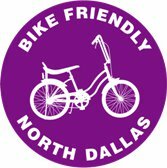 With all the controversy surrounding the hike and bike plan and our recent elections, you may have been hearing many people say that “the mixing of cars and bicycles is unsafe” (especially with drunk drivers on the road) or that parks or even sidewalks are an appropriate place to ride a bicycle. You may question those notions, as someone who rides on streets. Or you may share those sentiments, as someone who may not feel comfortable riding on the street. Well, our roads were made for bikes (learn more about the Good Roads Movement, in which cyclists helped lead the way to having paved roads in the first place) as well as cars. 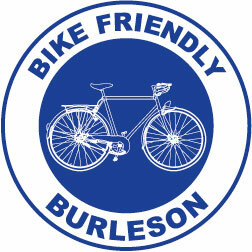 The full bike laws are available at BikeTexas, taken from the Texas Transportation Code, chapters 545 and 551. Arlington’s regulations are available here. Bicycle Austin also has a Right to the Road handout that you can print and keep with you for reference or to give away to help educate on sharing the road. It’s a great resource and we highly recommend it! Another great resource is BicycleSafe.com which shows 10 potential conflict situations and how you can ride to avoid them. Arlington traffic regulations (PDF) are not explicit about sidewalks, but they do say that “no person shall operate or use a bicycle or motor vehicle…on a trail or path not designated for use by such vehicle,” and we could assume that sidewalks are not designated for use by bicycles. Now you know the rules. As a driver you know what to expect when you see a cyclist, and as a cyclist you know what is expected of you when you’re riding in the road. But let’s say you’re 8 years old. Or 80. Or want to ride your bike with someone who is. Or you’re uncomfortable riding on the road. For those new to cycling or who simply can’t or don’t want to get out on the road with car drivers, on street-bike facilities can give you a higher level of safety and comfort, but still allow you to use your bike for transportation and get where you need to be. And let’s face it, if you’re 8 or 80, you can’t drive either. On-street bike facilities can provide the flexibility and safety needed to allow everyone, from 8-to-80, to ride their bicycle to their destination, so they can work, go to school, and spend money in our great city. 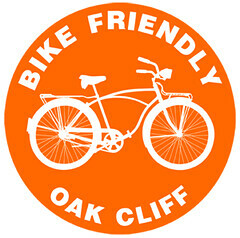 We’ll give more info on the benefits and types of on-street bike facilities soon, but in the meantime, our friends at Bike Friendly Oak Cliff have a great FAQ section on bike lanes. The mission of the world wide Ride of Silence is to honor bicyclists killed by motorists, promote sharing the road, and provide awareness of bicycling safety. Riders ride in complete silence for the entire ride. The Ride of Silence started in Dallas in 2003 to honor a fallen cyclist and has since grown to be a worldwide memorial event. Learn more about the ride. The ride takes place this Wednesday, May 18, departing at 7pm after a brief ceremony. 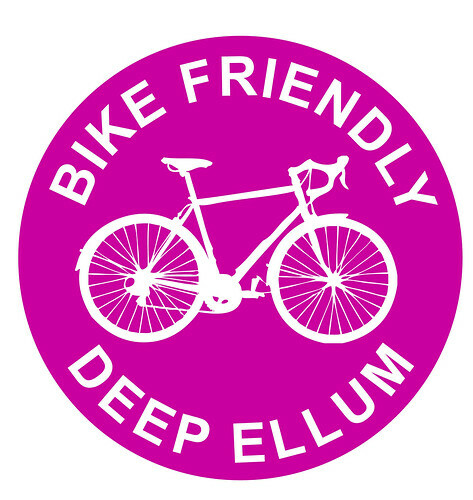 There are multiple rides happening in the metroplex, including Dallas and Fort Worth. Join in to honor fallen cyclists and promote sharing the road. If you couldn’t make Monday’s subcommittee meeting, you may have read in the Star-Telegram article: “Arlington’s latest plan drastically cuts proposed on-street bike lanes“. This is no joke. The Plan presented by the Council Subcommittee is such a cutback from the Plan recommended by P&Z in February, it’s actually a regression from the 2002 bike route plan Council asked staff and the consultant to update. So “yes,” the City’s political leadership has spent $250,000 and 1.5 years of staff time, and positive citizen participation to take Arlington’s hiking & biking infrastructure backwards. This plan is “Plan A” as recommended by P&Z in February (Source). The plan revealed on Monday, “Plan B,” (Source) was cut back by staff at the request of the council subcommittee that was formed to study Plan A. Council has felt pressure from the plan’s naysayers to reach a compromise. Those who oppose Plan “A” have spent a lot of time spreading myths and misinformation about the Plan, but very little time researching their own positions. This new Plan “B” is a false compromise, an average between Plan “A” and basically nothing. This false compromise is apparently a way to appease a vocal opposition, which has treated both supporters and the City Council very poorly during this debate. The city has published information about both plans on their site. See a comparison of the two plans (PDF). View a map of Plan A (PDF). View a map of Plan B (PDF). Election Day is May 14th, but early voting is going on now (every day!) and lasts till Tuesday, May 10th. 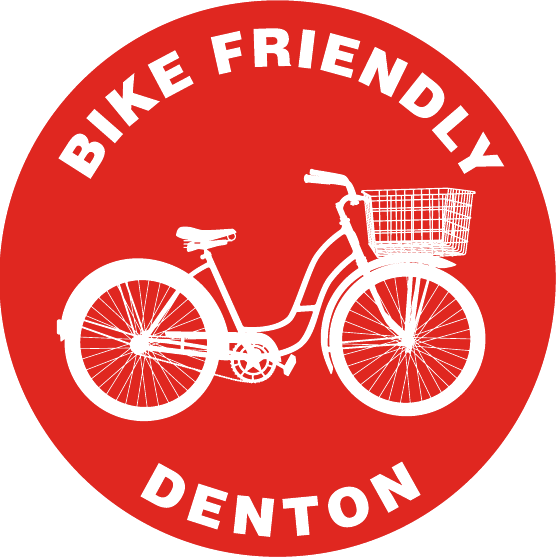 See our previous post on early voting information, and join us to bike the vote! While we are not going to tell you who to vote for or endorse specific candidates, we will provide a summary of what they have said about the proposed hike and bike plan, including this (poorly shot, apologies) video of them responding to a question about it at the Young Men for Arlington Candidates Panel on April 5. Robert Cluck: feels the plan needs more analysis. Mentions that parks are an appropriate place to ride a bike. Noncommittal. Carl Scrivner: does not support on-street bike lanes. Against. Gene Patrick: feels that Thoroughfare Development Plan should not be coupled with hike and bike plan. Noncommittal. Chris Dobson: supports hike and bike plan. In Support. Zack Maxwell: adamantly against road diets and the proposed hike and bike plan “in its current form.” Has many facts wrong, claiming that 36 streets are slated for road diets in the plan, when in fact only 14 street segments have proposed road diets. Against. Marvin Sutton: could support bike lanes. In support, but with limited evidence. Kathryn Wilemon: acknowledges that “alternative modes of transportation will probably be used in the future” and that “planning for the future is a top priority.” A member of the council subcommittee that is studying the plan further, she notes that there is room for compromise for the plan. Noncommittal. Kelly Canon: outright against the proposed thoroughfare plan. Has many of the facts wrong, claiming that over 200 miles of streets in Arlington will lose travel lanes for cars, when in fact only 28 miles of lane reductions are proposed in the plan. Believes “vehicles and bicycles do not mix on one road.” Against. Lana Wolff: says staff put a lot in the plan and that it is up to the Council to dissect the plan and come up with a reasonable plan. Added that if a neighborhood wants a bike lane they should go through the same process for a neighborhood that wants a speed bump. Noncommittal. Terry Meza: says she can support a plan around UTA and that connects students to downtown. Sees need in parks. Against plan in current form. Christopher McCain: has some concerns, but supports the plan. In Support. 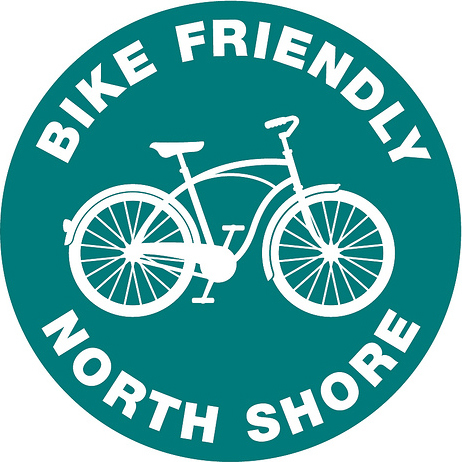 Julie M. Douglas: feels the hike and bike plan is a waste of money, that very few people will use the proposed facilities, and that on-street bike lanes are “an accident waiting to happen.” Against. Chris Hightower: feels that a bike plan that centers around downtown and UTA and builds outward from there will be more effective than a spread out, not-fully-connected system. Against plan in current form. The City’s secretary has ballot and finance information here. You can learn about all the candidates through the Chamber of Commerce’s website: VoteforArlington.com. The League of Women Voters has a good candidate handout (PDF). Star Telegram: Citywide article 1, Citywide article 2, and Mayor. Everyone has a specific district they live in and some of those districts’ council positions are up for a vote this year: Districts 3, 5, and 4. There are also council members that represent the city as a whole. The “at-large” positions to vote on this election are The Mayor and District 8. Here is a district map. The online version, including the incumbents can be found on the city’s webpage here.